Airborne noise isn’t the only sound you need to block if you are trying to create a quiet, soundproof environment. You also have impact noise to contend with, and some of the greatest impact noise can come from your floor. 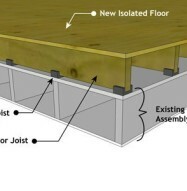 For improved soundproofing of a floor, order Floor Joist Isolators from Soundproof Cow. 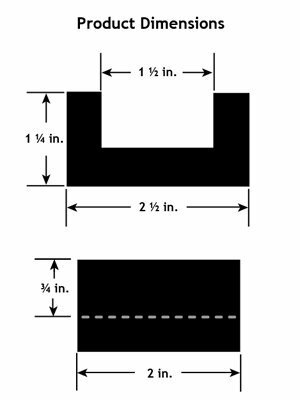 If you’re not familiar with Floor Joist Isolators, these U-shaped thermoplastic pieces fit easily over floor joists to improve both the Sound Transmission Class (STC) and Impact Insulation Class (IIC) of your flooring assembly. They do this by isolating the flooring from the structural supports. This prevents vibrations and vibrational noise from traveling through the structural supports and transmitting sound into the room through the floor. These Floor Joist Isolators can be useful in a wide variety of situations but are especially helpful in a do-it-yourself soundproofing project such as creating a home recording studio. 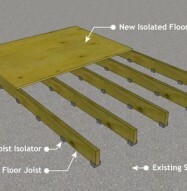 These joist isolators fit right in place with no tools required, so anybody can make use of them. 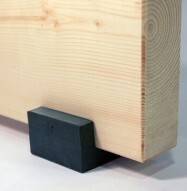 The stud beam isolators can fit any 2X lumber product. Floor soundproofing is often neglected when building soundproof environments. It is tempting to think all sound can be controlled through the walls. But if you want a complete soundproofing solution with dramatically reduced impact noise, Floor Joist Isolators are an important part of your overall soundproofing design. Floor Joist Isolators from Soundproof Cow are quite affordable, especially when you buy them in larger quantities, so order yours today. Dimensions 2 1/2 in. x 2 in. 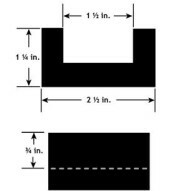 Floor Joist Isolators are a U-shaped isolation product constructed from a medium density thermoplastic which is designed to isolate vibration and structural noise transmission. 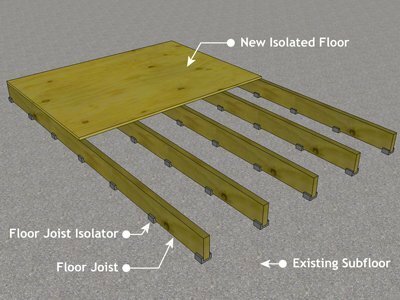 Floor Joist Isolators improve a flooring assembly’s Sound Transmission Class (STC) and Impact Insulation Class (IIC) by decoupling the flooring from the structural supports which provides a reduction of sound transmission, especially the hard to control low frequency sounds. The Stud Beam Isolators are sized to fit any 2X lumber product, are very easy to install and are best used for new construction when floor joists are exposed. 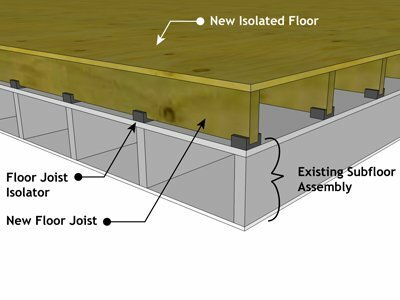 Good Soundproofing Performance — Floor Joist Isolators are attached to floor joists in order to structurally isolate floor surfaces, including substrates, from the structural support elements. They are a cost effective product that reduces sound transmission through floor or ceiling assemblies. Floor Joist Isolators are perfect for applications that use the “Box in a Box” or “Room in a Room” construction methods commonly used when building a professional home theater or recording studio environment. Quality — Floor Joist Isolators are made from a medium density thermoplastic that is commonly used to make vibration isolation feet or vibration damping pads for large industrial machinery. The raw material is a time tested vibration isolating material. Ease of Installation — Floor Joist Isolators are friction fit over any wood with a 2 inch width (actual width equals 1.5”). No messy glues or adhesives are needed to install is product. No tools required! Cost Effective Soundproofing — Floor Joist Isolators are our most cost effective sound isolation product due to the ease of installation. Labor costs are minimal to install this product. Light Weight and Low Profile — Floor Joist Isolators are designed to provide effective soundproofing performance with minimum added weight and thickness. The low profile maximizes valuable square footage. 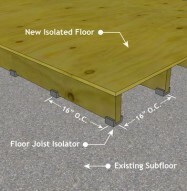 In-stock — We stock Floor Joist Isolators in large quantities. 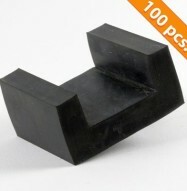 Most orders are filled and shipped the same day the product is ordered. I was really happy with how much using your floor joist isolators helped. Thank you so much for your help. When I got the joist isolators I was convinced I bit off a little bit more than I could chew. After calling in and speaking with Jim about proper install it went really smooth. I was really happy with how well it helped too.